I have been very sneaky about meatballs lately. I have a secret (until now) fear of attempting meatballs and having them fall apart when I fry them. I love fried foods, but hate frying. I never get it right! But my son loves meatballs (we call them albóndigas), they reheat well, are convenient for lunches, and keep frozen for ages. And then of course, I prefer him (and me) to eat homemade everything. So I resort to manipulation. I get the meat (3lbs organic ground beef) and then tell my dad I need his help to do meatballs because I want to learn his recipes and techniques (which is true), because he makes the best meatballs in the world (also true), and because with my son vying for my attention all the time, it is hard for me to get such a project done all by myself (also true). Then, my dad – who has always been the kind of father who would start helping with your science project and end up constructing a windmill of Frank Lloyd Wright-worthy grace, proportion and utility while you sat idly watching over his shoulder, without getting a chance even to drive a nail – well, he takes over the meatball-making process, so by the time he is heating the oil, I am either making a salad, doing dishes or otherwise safe from the dreaded frying process. This time, however, there was thawed meat that needed cooking, no dad to call on for assistance and too much seasoned ground beef already stocked in the freezer to make switching gears a viable escape route. It was a snow day and Leandro was occupied with visiting friends. So, I had to face my fear and man up. It was time to make some meatballs. 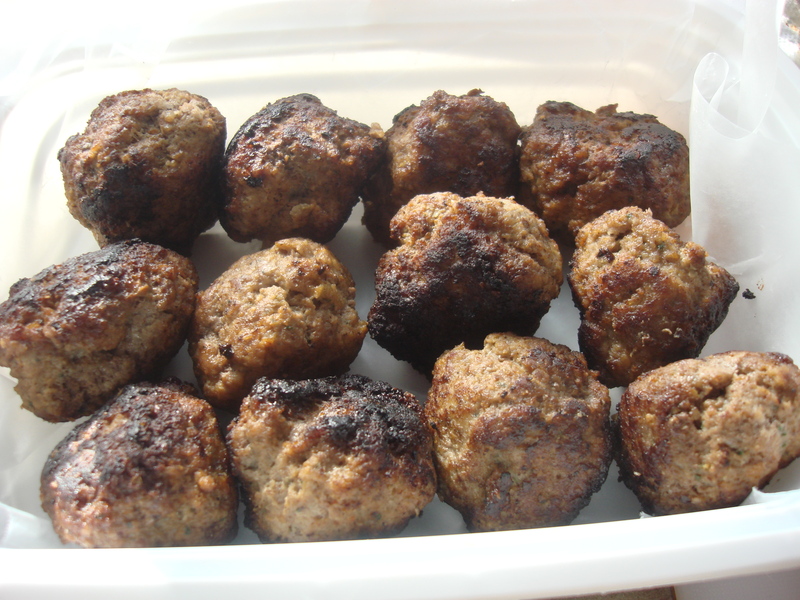 And meatballs I made using the recipe I have been writing down and editing everytime I watch my dad make them. He is getting used to using measuring instruments instead of just eyeballing the ingredients so I get an accurate measure. Whir garlic, onions, olive oil and parsley in a blender or food processor until minced fine. Add chile powder, Old Bay and salt and pulse a few times until it forms a paste. In a large bowl place meat, seasoning paste, optional eggs, and bread crumbs. Mix well so that breadcrumbs are evenly distributed. Using your hands, roll into balls about 1.5 inches across. You can dip your hands in water to keep from sticking.